I went to the New Orleans Comic-Con and found myself. I don't mean that in any sort of spiritual or philosophical way. I mean I was walking down an aisle in the exhibit hall, and there, at one of the booths, was a picture of me. That's a really weird feeling. Of course, it wasn't just me in the picture. Thomas, Soren (voice of Herb), Genna (PA extraordinare), a guy named Justin (director of photography onThe Night Shift short) and the blasted skeleton were all in the picture, as well. I had just passed a booth advertising our local Genre/Gaming convention, and our picture was one being used for publicity. It was a shot from a panel we gave on indie filmmaking two years ago, right after we finished the short. In fact, that was also the day of our very first screening. This was a big day for Fighting Owl Films, and one of the first in a string of events that drove us to attempt filming a feature version. This photo is the only documentation we have of that momentous occasion, and should be treasured for years to come. This is quite possibly the worst photo I have ever seen. We all look completely nervous and totally overwhelmed. 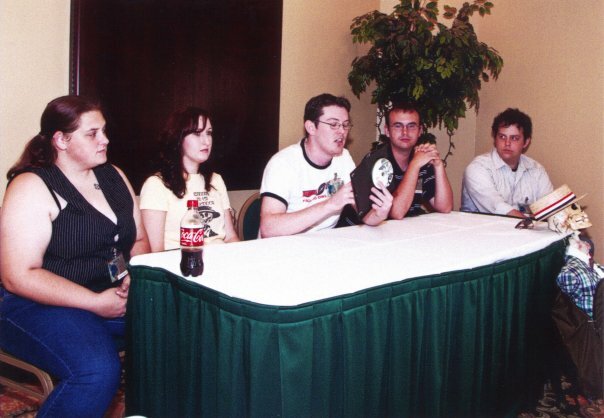 It was actually my and Thomas' first Con. Period. and we had no idea what to expect. The panel came before the screening, so no one knew who we were or what the film was about. We fielded a lot of questions on Mobile tax incentives vs. those of New Orleans (Answer: we don't know), and a few that caused us to suggest they seek legal counsel. There were some fun times trying to get the skeleton torso in and out of Thomas' car (people look at you funny when you load a body into the trunk). We strolled around the exhibitors' floor for a while, bought a t-shirt, and saw Space Ghost. The boys got a kick out of the belly dancers, and I had my camera pillaged by a pirate (hence this one photo being all we have). Eventually, we did get around to the screening, and the audience seemed to really enjoy the film. All in all, I'd call the day a success. Well this week I dropped off two screeners at the post office. We're submitting The Night Shift to a couple of festivals as a work-in-progress. Basically it's done, but needs a little window dressing for the "wow factor." With any luck, maybe these festivals will accept the film, and you guys might actually be able to see it. Wouldn't that be lovely? I'm sure, by now, you're all wondering why the heck we haven't finished this thing, yet. Trust me, we haven't been sipping mai tais on the beach. The fact of the matter is, while Mobile is a beautiful place to shoot a movie (you hear me, film companies? It's freaking GORGEOUS here! ), post-production is a little more difficult. See, we don't have a studio. We don't have a dedicated crew of post-production specialists. Yes, there are some video-editing companies in the area, but none of them (including those in film-heavy New Orleans) do color correction. No one around here works in special effects. Our composer is from here, but he's the only local (besides Thomas) on the post team. My point is that much of this post-production time has been spent finding a crew, then uploading footage, waiting for the effect/sound/whatever to be added, downloading the footage, checking it, then sometimes starting that whole process again for corrections. If the artists were in the same room with us, this would have been a much quicker process. I'm not trying to make excuses for taking a while - I'm not sorry that we have. We'd rather take our time and do things right. What I am trying to do, though, is explain the (really) indie process vs. what you'd find in a studio setting. The short version is: it's a lot more difficult and time consuming. For instance, in a studio setting, if you need effects, you go to ILM (Industial Light and Magic) or a similar company. Maybe your company has in-house artists. In any case, you have money, or at least connections, so you hire someone. End of story. Our company doesn't have that kind of money, and we don't know anyone. We had a small budget for special effects (heck, the whole movie's only around ten grand), so we had to find someone good who was willing to work for a little money and a lot of experience. We started off looking in filmmaker forums, which brought us to effects guy Number One. Number One sent us a beautiful demo reel, and really wanted to work on the feature. We sent him a couple of scenes to test on, and when the work came back, realized immediately that the beautiful demo reel wasn't his. Bye bye, Number One. Effects guy Number Two was a really sweet college student whose demo reel actually belonged to him. Unfortunately, one or two scenes in, his Mac died and he disappeared, never to be heard from again. Thank goodness we hadn't paid him, yet. Number Three was when my brain hit maximum capacity. I have apparently blocked the experience from my mind. Effects guy Number Four was an exceptionally talented young man, who worked very dilligently, and sent us some amazing shots. Unfortunately, he had some family issues and needed to take a break. Number Five was an adorable little boy who looked just like Justin Bieber (I won't hold it against him). He approached us, and had a great demo for a tween. I count him because we did send him a test shot to play with, and did give him some proper consideration, but he wasn't quite advanced enough for what we needed. The kid has some serious potential, though. This brought us to Number Six, who ended up being downright brilliant and very professional...and then his computer suffered a massive system failure, causing him to reluctantly have to bow out. By this time, Number Four was back, and able to finish the last of the effects, albeit in between rolling blackouts due to the snowstorm pummelling his area of the country. Now, that's dedication. We ended up with some fantastic effects, and the two gentlemen who worked on them were every inch professionals. Finding them and working long-distance were the issues. Unfortunately, that's just the way it had to be. It's slowed things down, and added a few headaches, but ultimately, everything is getting done, and the movie is shaping up to be a lot of fun. Hopefully, you'll get to see it. I'll keep you posted.